And here it is before we did anything to it besides cram everything in there. A hot mess, I know. It drove me crazy so I'd just shut the door and try to ignore it. 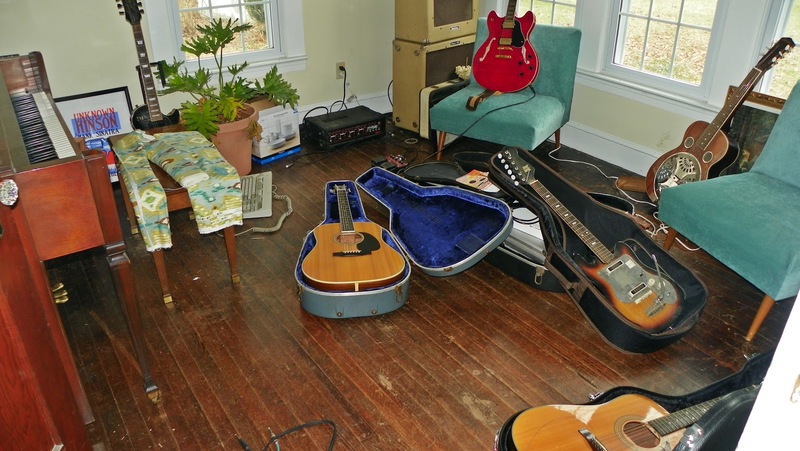 I wanted it to be like a little sitting area/lounge where Daniel could go and play his guitars either by himself or with a friend. 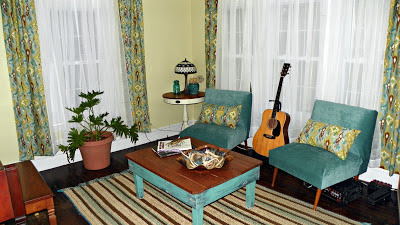 I already had those chairs and I had some other things designated for the room like a rug, coffee table, and the flower table from my previous post. 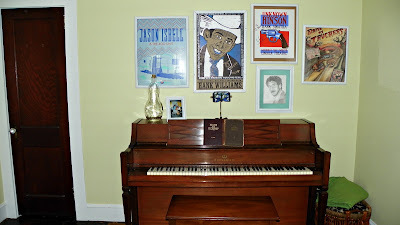 Daniel had collected concert posters over the years that I wanted to hang in there to keep the whole music theme going on. 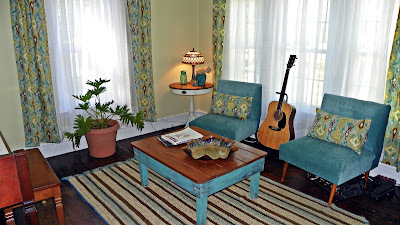 First off, we cleared out all the junk and I painted the room a pale lime green which I really like. 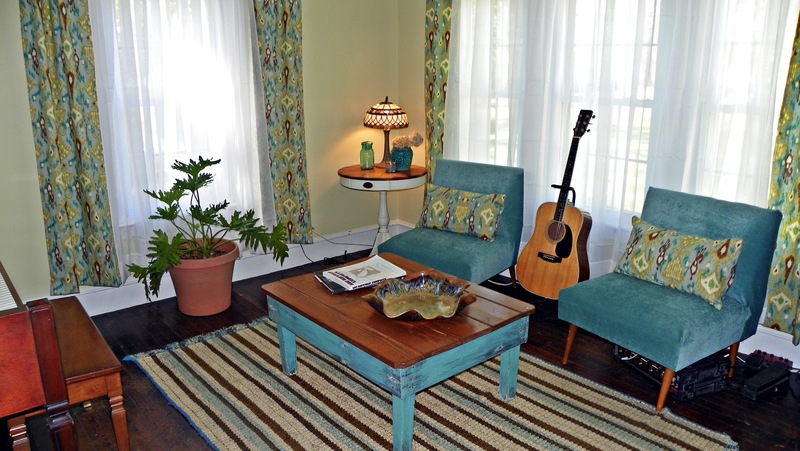 Because of all the natural light, it always seems really bright and fresh. I know, green seems to be a theme in our house, but lime green is Daniel's favorite color and since he spends the most time in there, it seemed fitting. Of course, if he had his way, our entire house would be drenched in day-glo slime green so it's a bit of a compromise. 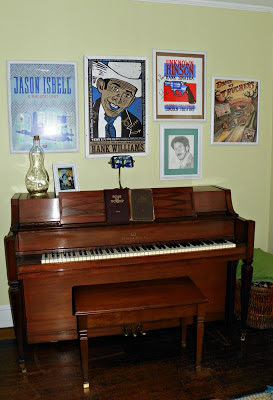 I purchased some fabric for curtains (on the piano bench in the picture above) and sewed some simple curtain panels. My mother in law made some pillow covers for me out of the same fabric to dress up my chairs. The curtain rods came with the house so I didn't have to buy those. 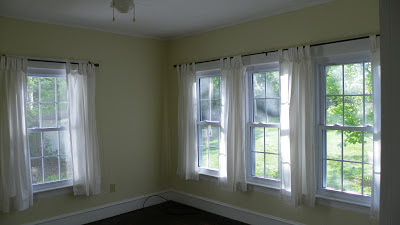 Since the windows are such a prominent feature in the room, I raised the curtain rods to make the windows appear larger, hung my new curtain panels and filled in with plain white sheers. Just hanging the curtains made the room appear so much bigger. I also like that the sheers keep things a little more private but still let in a lot of light. Then came the fun part. I had Daniel paint some frames that we already had (they were black, he painted them white) so I could do a gallery wall with all the concert posters. I also thought this was a good place to hang the portrait of Daniel's Uncle John, who taught him how to play guitar. Then I got to "dress" the room. 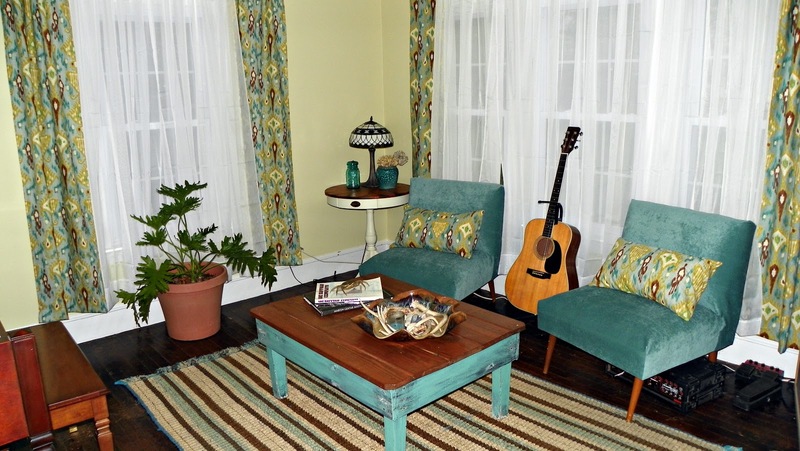 I brought back the chairs and pillows, placed the rug, coffee table, and side table. I tried to hang my DIY Cupcake Liner Orb Light from this post, but unfortunately, it made the room waaay too dark, so it wouldn't work in there like I had planned... womp womp. I guess I'll have to find someplace else for it to live. There are still a few things to be done in there, like refinish the floors, paint the trim, change out the ugly fan for a more attractive light fixture, add some electrical outlets (there's only 1 in the whole room) and get some brackets made to hang all Daniel's instruments [which was supposed to be done already... not naming any names...coughDanielcough...hint hint] but overall it's sooo much nicer in there. Now I can walk by without cringing or slamming the door in frustration. All those instruments probably seem extravagant for two brokies like us, but we were talking about it the other day and realized that we have only ever purchased 1 of the instruments that we own... the rest were gifts. We are so thankful and lucky to have such generous family and friends! This came out really pretty. There is an amazing difference between the before and after! I love the turquoise.